"I'm gonna make some weird sh*t."
Baby Groot really is so cute. Anyways, the familiar and utterly likeable Guardians of the Galaxy team is back together in the latest Marvel Studios cinematic effort. Writer/director James Gunn returns to craft Guardians of the Galaxy Vol. 2 into a wholly enjoyable sequel experience while mostly paying off elements teased throughout the first film alongside another killer (mostly diegetic) soundtrack of classic pop hits. For both good and some ill, Vol. 2 is very much more of the same. Everybody's boyfriend Chris Pratt furthers his comedic hero persona as the wise-cracking leader, Star-Lord/Peter Quill. He finally faces his heavy daddy issues head on meeting the alien celestial being known as Ego the Living Planet but isn't given very much to do beyond that lacking the same heroic motivation the first time around. An energetic Kurt Russell conjures Ego with enough wit and fun dialling up the hammy bravado to disguise his somewhat thin material as his big galactic plans are haphazardly rushed together and more than a little contrived. 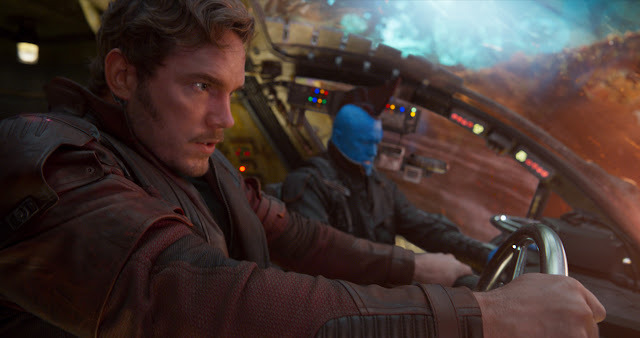 Surprisingly, Michael Rooker as a returning Yondu, the loathsome ravager and pseudo father figure to Quill gets a nice, heroic arc in linking the strange alien double father-son dynamic together well. The plot is fairly standard and involves several MacGuffins and convenient plot points but stands almost entirely outside the rest of the Marvel Cinematic Universe. It's disappointing things ultimately resort to stolen goods, setting off a bomb, and reconciling one's enemies but it still mostly works despite few immediate villains or conflicts, lots of explosions, and plenty of clunky exposition. Gunn really furthers the themes of fatherhood and family by bonding the team together through their dysfunction while temporarily splitting them up as he crafts the superhero space opera as a weird familial melodrama. Zoë Saldana and Karen Gillan as duelling sisters, Gomora and Nebula, get more to do but their antagonistic relationship feels forced and exists mostly outside the main action. Quill and Gomora's budding romance is more satisfyingly teased this time around building their emotional journeys for some nice character moments. Hands down though, Dave Bautista's dryly deadpan performance as Drax steals every scene he's in as a standout highlight with pitch perfect, overly literal comic timing and delivery. Newcomer Pom Klementieff is fun as Mantis, an alien empath who befriends Drax, embracing the campy alien nature of her surroundings. Rocket (Bradley Cooper) and Groot (Vin Diesel) are still delightfully fun, if slightly unrecognizable, in their broad comic CGI portrayals. Guardians 2 really amps up the visual language of the franchise full of bright colours and sparkling action. However, alongside the exhilarating visuals are some pretty disturbing acts of wanton murder and jarring shifts in tone. If not for Gunn's mannered balance of weirdness and offbeat situations, the often strange detours in building all the different ragtag relationships might not have deepened the emotional stakes as needed. What's most enjoyable about Vol. 2 is more of Gunn's trademark weird humour and cinematic flourishes. While the first was more fluid and narratively forward driving, the sequel often feels more satisfying character-wise. His taste of 1980s Hollywood nostalgia and references are all aces in grounding the ridiculous space concepts together.